Investing in the Artist Grant Opportunity Open Now! 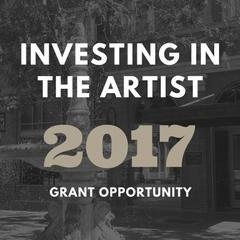 The City of Santa Ana is now accepting applications for the Investing in the Artist Grant Opportunity 2017! The Santa Ana Arts and Culture Commission supports projects that will enrich and invigorate the Santa Ana arts and culture landscape. The grant intends to assist emerging and established artists who live and create work in Santa Ana or create work that is for the enrichment of the Santa Ana arts community. Individual artists, as well as arts and culture nonprofit organizations, are invited to apply. Funding will be provided through reimbursements for eligible Investing in the Artists expenses and will be awarded in the amount of $2,500 or $5,000 for artists and $5,000 or $10,000 for arts and culture non-profit organizations. The grant period will be for 12 months and will require an interim and a final report on outcomes achieved. Interim and final reports will require documentation, such as receipts, to support grant expenditures. Applications are accepted online and are due on the Submittable website by Monday, May 1, 2017 at 4 p.m. Event dates, times, and locations may be subject to change under certain circumstances. Please check the timeline on the arts grant webpage for any changes prior to attending the Information Sessions, City Council and Arts and Culture Commission meetings.